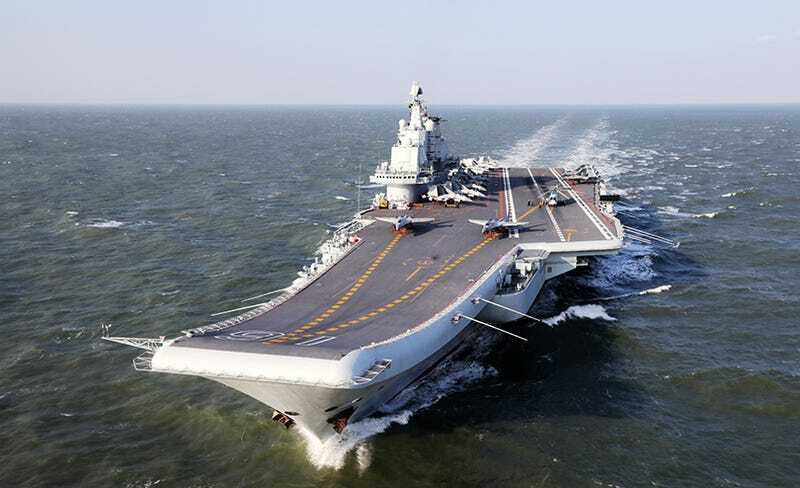 The Chinese government has reportedly sent its only aircraft carrier through the Taiwan Strait, the body of water that separates mainland China from the nation of Taiwan. While no missiles have been launched yet, Taiwan launched fighter jets and maritime patrol aircraft in response. Taiwan’s current president Tsai Ing-wen leads a political party in favor of formal independence from China. That’s why U.S. President-elect Donald Trump’s unprecedented telephone conversation with her ruffled feathers last month, and the reason a Chinese aircraft carrier sailing between China and Taiwan is being interpreted as saber-rattling. It’s all connected. Since Trump won the election, his words and actions have touched China’s bottom line. I think this was directed at America and the Taiwanese authorities. The aircraft carrier was on training exercises after all, but on the other hand, choosing this route to return was a response to their provocations. But the Times also heard from Euan Graham, the director of the International Security Program at the Lowy Institute in Sydney, Australia who basically said that the Chinese carrier had to choose between two routes to return to its home port: it was either the Taiwan Strait, or a close pass with the Japanese islands. And Graham indicated that the Chinese government simply made the more practical and tactically logical choice. The ship did make this journey once before, in 2013, which yielded a similar result: a few Taiwanese jets went into the air and nothing else happened according to Focus Taiwan. At that time the Liaoning stayed west of the Strait’s midline, closer to China, as it appears to be doing again today. If it continues on its course, the ship and its escorts will apparently be clear of the strait by the end of the day.